Each element that you add to your website, can be further edited or modified. Hover the mouse over the element that you want to change and above that element (in the right upper corner) the "Options" and the "Delete" links will appear. 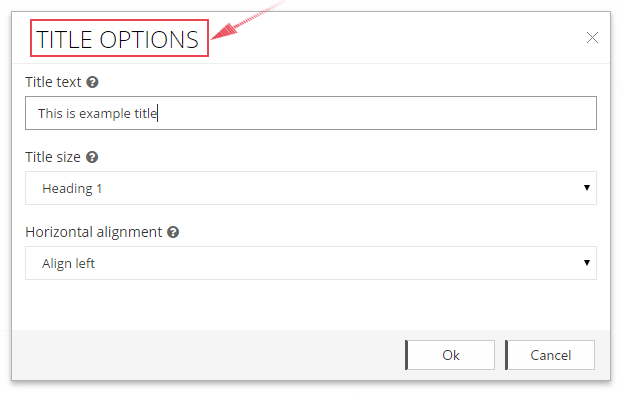 By clicking on the "Options" link, the window with the element options will be opened. Here you can make any desired changes of the element. By clicking the "Delete" link you can remove the element from the web page. You can also edit each element and change its position by simple drag and drop. To do this you need to position your mouse over the edge of the element you want to move (or position the mouse in the upper left corner on the icon with four arrows). Click and drag the element to where you want to place it and then drop it. With this, the element will be moved to the new position on the web page.